The Anti bacterial properties of Tea Tree Oil & Neem Oil Fights with acne causing becteri in the skin & enhances the skin to fight against Acne. Massage in upward motion for 2 - 3 mins. Ideal for Removal of pigmentation. 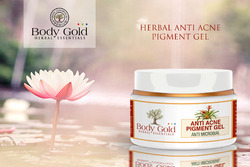 SUMUKHI GEL : This is a translucent gel which reduces pigmentation, the uneven skin tone that makes skin look older. natural herbs removes the outer dead cells. Other active ingredients prevent melanin from coming to the surface. Skin looks more luminous and even toned.